Eat down is in full swing now. We have had this little steak piece moldering away in the freezer for quite a while so it is time to use it. One potato is enough for two people. And this is the third time I am using the asparagus I bought last week – one time with classic chicken, once as a pasta sauce, and tonight cut up so the six spears I have left look more substantial. I make a chimichurri sauce to use up a piece of shallot, leftover parsley, two garlic cloves, and half of an old lemon plus my everyday olive oil. 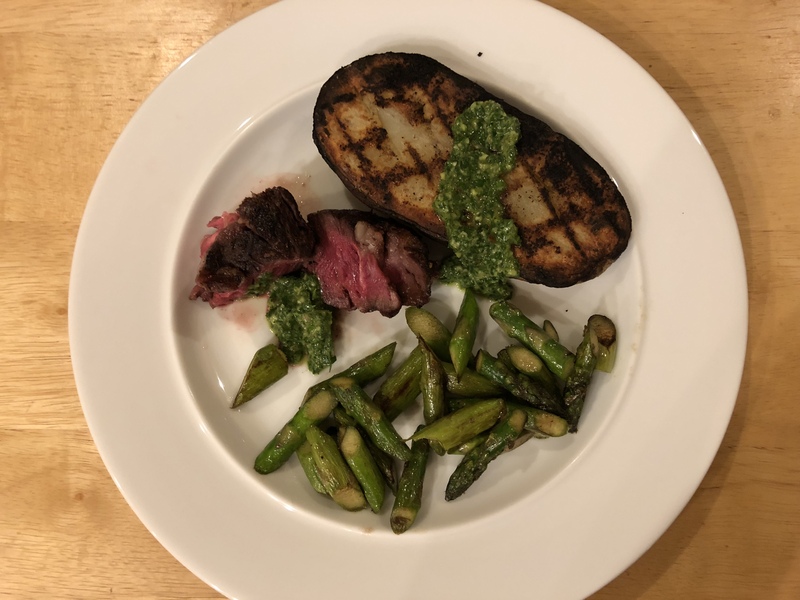 This entry was posted in American, Beef, Easy, Grilling, leftovers, Vegetables and tagged asparagus, grilled potato, Rib cap steak. Bookmark the permalink.